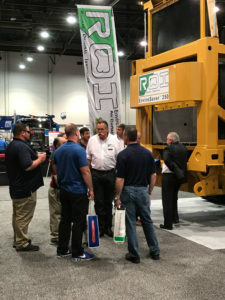 The introduction of our EnviroSaver 350 at Waste Expo in Las Vegas last week was a resounding success. A hearBelt thanks to all of you who came to visit, we truly appreciate all the compliments and interests we received. We presented the only practical and financial rewarding ways to simply deal with wood and vegetative matter through volume reduction by way of conversion, resulting in an end-product, biochar. The EnviroSaver 350 on display was sold during the show to Novus wood in Houston TX, who is one of the largest wood processors in the country. Novus wood and ROI have entered in to a joint Biochar market development agreement aimed at establishing a standard for Biochar, providing guidance to customers on how to best produce high quality char, and to provide a well-paying and steady outlet for biochar produced by ROI’s customers. We are currently developing a portable char quenching system designed to separate rock, clinkers, metal and the valuable Biochar. The quenching system will be available this summer and will be complimentary to all ROI model carbonizing systems. The ROI EnviroSaver and CARBONATOR Series reduction systems are the first systems of this type. Operating on advanced principles and processes not used in other wood and vegetative debris processing systems. ROI has designed the carbonizing systems to strike a balance between high-volume conversion of wood and vegetative debris, reduced greenhouse gas emissions, and the ability to produce a high-quality end-product, biochar. Both high or low moisture material can be fed, and no grinding or chipping is required, or suggested. With diminishing markets for clean wood and vegetative debris, grinding, hauling and disposal costs can be drastically reduced through on-site conversion, utilizing ROI’s systems. Through the conversion process volume can be reduced by 60-80%, leaving customers with an end product that can be land applied or sold for beneficial use.